to the Anglo-Persian Oil Company, Ltd.
United Kingdom and the Anglo-Persian Oil Company, Ltd.
(b) Shaikh's reply, dated 6th June 1935. (/) Letter from Political Resident A senior ranking political representative (equivalent to a Consul General) from the diplomatic corps of the Government of India or one of its subordinate provincial governments, in charge of a Political Residency. 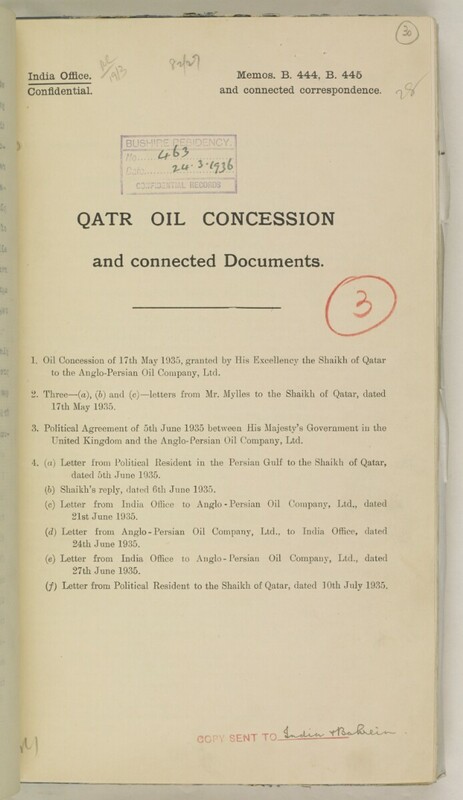 to the Shaikh of Qatar, dated 10th July 1935.